To gauge public perceptions towards Sonoma County’s wine community and determine how residents really feel about us amidst recent media coverage on grape growers and wineries, Sonoma County Winegrowers worked with the opinion polling firm, Fairbank, Maslin, Maullin, Metz & Associates, to conduct a telephone survey of 400 registered voters living in Sonoma County to obtain their views about the local wine community and its impact on the quality of life in our county. 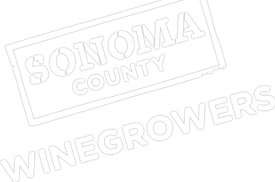 The survey results found that an overwhelming majority of voters believe strongly that the wine industry has a very positive impact on Sonoma County. Voters recognize the wine industry’s important role as the backbone of the local economy, in providing jobs, in bringing tourism to the area, in preserving our agriculture heritage and in contributing to the community through charity. Sonoma County voters are also very supportive of wine community events including wine pick-up, tasting weekends, weddings and visits from distributors. We believe it is critical that everyone is aware that the majority of Sonoma County registered voters have a positive view of the wine community so we want to share the specifics of the survey. We presented these results at January’s Dollars & $ense and we’ve received many requests for a copy.